Heat networks have proved to be a reliable and cost-effective means to supply low-carbon thermal energy. And yet, just 2 % of buildings in the UK are connected to them. As a result, the Department for Business, Energy and Industrial Strategy launched the Heat Networks Investment Project (HNIP) last October to increase the percentage of district heating in the country by providing British Pound (GBP) 320 million of capital funding over three years. In cooperation with the IEA Solar Heating and Cooling (IEA SHC) Programme, it also organised a one-day workshop to find ways to integrate solar energy into these systems. Titled Solar Heat Networks: Policy, Planning, Design & Performance, the event, attended by planners, engineers, administrators and utility staff, took place in London in early March. The workshop was part of the IEA SHC Solar Academy and was supported by Task 55. The organisers invited two SDH experts from the IEA SHC research platform Towards the Integration of Large SHC Systems into DHC Networks (Task 55): Jan Erik Nielsen (right), who works at engineering firm PlanEnergi, based in Denmark, and Christian Holter, CEO of S.O.L.I.D., an Austrian supplier of solar thermal turnkey systems. 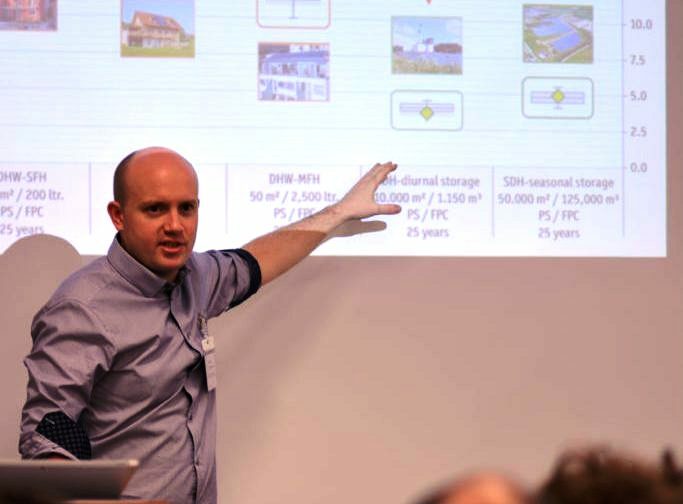 Both held several presentations to show attendees how to integrate solar and seasonal storage into heat networks, how to assess system performance, and what there is to know about heat supply contracts. Richard Hall, Alternate Vice Chair of IEA SHC, said that renewable heat was not on a path to growth. “However, solar heat networks are now becoming possible in the UK due to the HNIP, which aims to increase the number of networks being built,” he added. HNIP offers grants covering up to 50 % of the capital expenditure, up to a maximum of GBP 5 million, and loans ranging from GBP 25,000 to GBP 10 million. Funding rounds have been scheduled for each quarter. The first round closed on 5 April. The two-stage process starts with an initial check to ensure that a project meets eligibility criteria and continues with submitting a complete application. Funding can be requested at any time. Consequently, HNIP’s administrators are encouraging applicants to get in touch with the department as early as possible.